References: Megastar V4.0, Sky Catalogue 2000.0 Volume 1, (1982). v = variable. How closely do the 3 Great Pyramids at Giza match their heavenly counterparts? 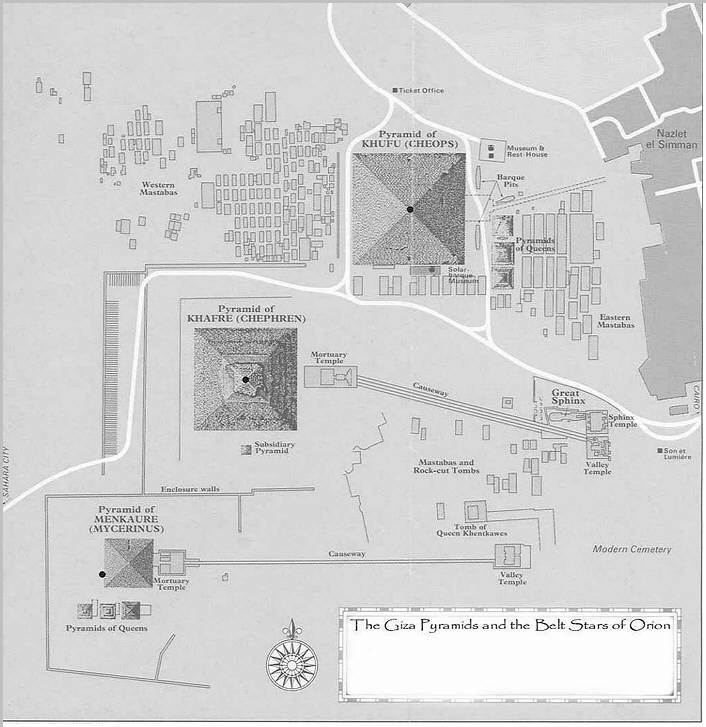 By superimposing a plan of the Giza plateau with a star chart of the area of the three belt stars of Orion. On can see that the match is almost perfect. The error is about 8' 11" or 0.1364° for the pyramid of Menkaure by aligning the stars Alnitak and AlNilam with Khufu and Khafre. A small rotation is necessary to get the exact orientation. The Giza Plateau seen from a low earth orbiting satellite. Here a plan of the Giza Plateau is super imposed with a star map of the three belt stars of Orion, Alnitak, Alnilam and Mintaka. By aligning Alnitak with the apex of Khufu and Alnilam with the apex of Khafre the apex of Menkaure is 8' 11'' off from perfect alignment. The field must also be rotated 15 degrees counterclockwise to achieve the alignment. The view is only valid from the perspective of looking at the Pyramid from the north . It is a mirror image of the stellar alignment. If one were to view the Pyramids of the Giza plateau from the north during a clear moonless night with Orion transiting the three Pyramids would appear with their three counterparts in the sky, Alnitak, Alnilam and Mintaka. For the Giza complex to align without a rotation one must return in time to 11359BCE. 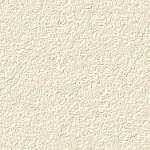 This is according to CyberSky 3.1. Or from the future time of 2554 CE. 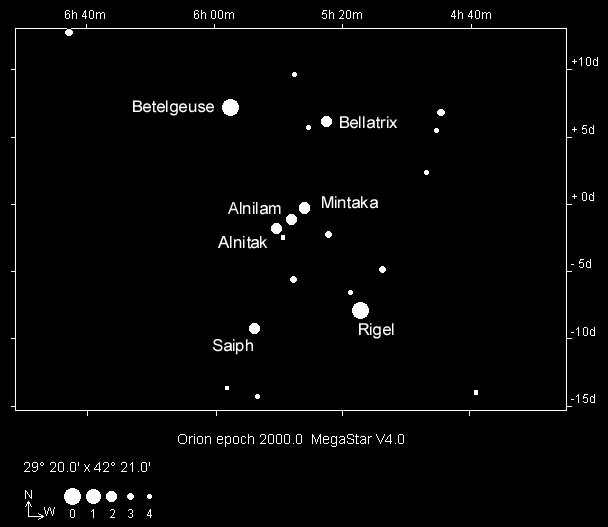 Orion reaches its farthest point south at 10450 BCE (CyberSky 3.1). The rotation is caused by procession of the equinoxes, the phenomena responsible for this gradual shift of the stars. It is caused by the pull of the Sun and the inclination of the earth's axis to the ecliptic, the plane of the solar system. This causes the axis of the earth to describe a circle in the sky every 25,800 years. The terrestrial axis describes a processional circle of 23.5 degrees in the sky. 1) That the 4th dynasty Ancient Egyptians were star worshippers and knew considerably more about astronomy than previously thought. 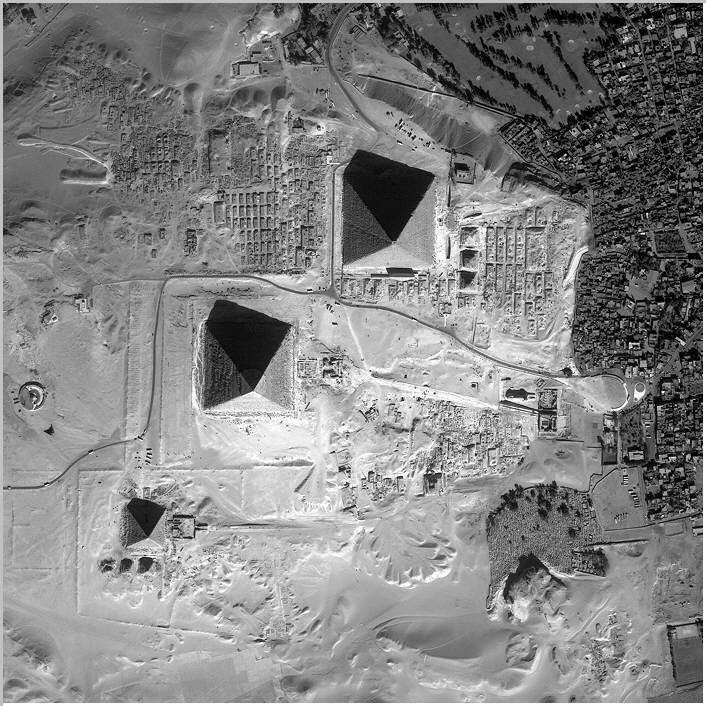 2) That the three Giza Plateau Pyramids were planned as a whole. 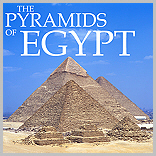 And the 3 great Pyramids were symbolic of stars and not tombs as Egyptologist now believe. Is there any scientific evidence that the layout of the 3 great Pyramids at Giza (Khufu, Khafre and Menkaure) correspond to an image of the three belt stars of Orion (Alnitak, Alnitan and Mintaka)? There as been much publicity in recent years concerning this subject (Bauval et Al.). Here I present some scientific evidence that shows indeed that there may me something to this.